Yes he did! What should we expect from a Muslim sympathizer President. Why would the President of the United States of America be bold enough to trade 5 murderous Afghan Muslim Terrorists for an American Deserter? 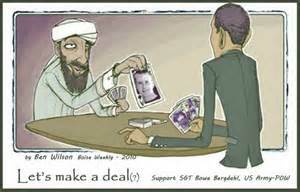 Perhaps, we can gain some insight into this inequitable deal by looking at the inner workings of the Bergdahl Family. “I’m thinking of joining the Army,” he told his folks after ­already having signed up.